The Home Guard In Dacorum | The Dacorum Heritage Trust Ltd.
DACHT : 432.67.11. 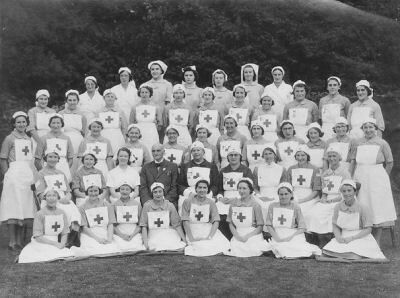 Hemel Hempstead Red Cross during the Second World War. 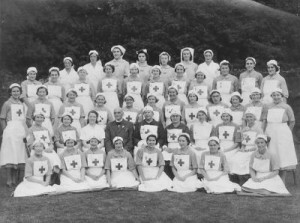 Red Cross personnel staffed the wards of Ashridge emergency hospital. DACHT : 2377. Map showing the various ARP districts of Dacorum. DACHT : 62.12.11. 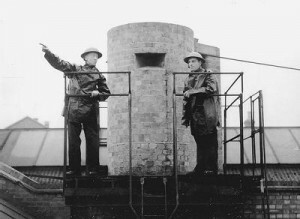 Fire watchers at Apsley Mill, Hemel Hempstead. DACHT : 62.13.11. Members of Flamstead Home Guard, including Mr Smith the baker, who was also the Chief Warden. They are standing outside the Post Office, which had been protected by sandbags. DACHT : BK 7236. Identity card of James Deacon, an Air Raid Warden in Berkhamsted. The Local Defence Volunteers (LDV) was an organisation which had been formed in response to the threat of German invasion. Unfortunately, these initials were sometimes interpreted as ‘Look, Duck and Vanish’, as initially the men wore their own clothes and were armed with little more than broom handles and spades. In May 1940, Winston Churchill changed the name of the LDV to the ‘Home Guard’. Members were at first issued with denim uniforms, which were later replaced by khaki uniforms. These new uniforms and associated equipment gave a more professional appearance. 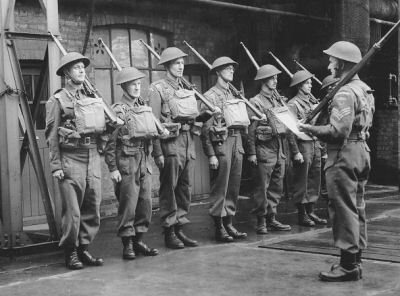 Older men who had not been ‘called up’ for active service could join the Home Guard. 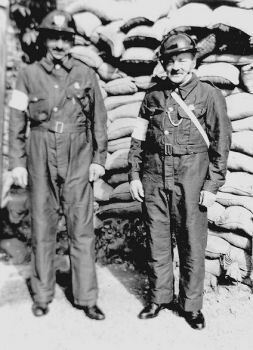 The organisation was often referred to as ‘Dad’s Army’, as the majority of men were over 50 and many had fought in the First World War. By 1942, it was made compulsory for all men aged between 18 and 51 who were not already serving, to join in areas where more recruits were needed. 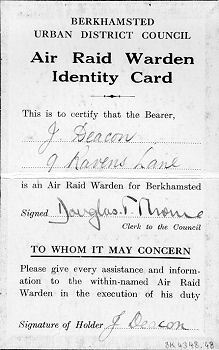 Home Guard Platoons were organised throughout Dacorum and there were observer posts at King Langley, Berkhamsted and Markyate. These posts monitored enemy aircraft and particularly looked out for parachutists, who may have signalled the beginning of an invasion. 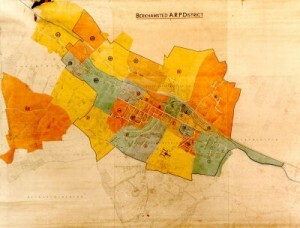 Mr Kirk, the ARP Controller for the borough of Dacorum, reported that in six years there had been a total of 828 air raid warnings, during which 90 high explosives bombs and 350 incendiary bombs fell on the town.